Meade Potato Co. was honoured to win the Innovation category at Marks and Spencer's Farming for the Future Awards presented at the Balmoral Show this year. 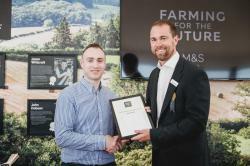 Pictured above are Patrick Meade being presented with the award by Peter Kennedy, Agriculture Manager at Marks and Spencer. The judges cited the family's passion for sustainability, innovative approach to reducing food waste, energy use and improving efficiency, as well as their willingness to help educate other producers about innovative, sustainable practices. "We are delighted to receive this award as it recognises the commitment to quality and sustainability that we share," explains Patrick Meade. "Innovation, sustainability and efficiency go hand in hand." The Meade family first started selling potatoes in local towns in the Co. Meath area in 1977. The Meade Potato Company now employs approximately 240 people, and Philip Meade, along with his father, Philip, brother Patrick and sister Eleanor, now oversee the production of a range of potatoes and fresh vegetables. Philip is committed to running a business that is as efficient and sustainable as possible and this has led the Meade Potato company to roll out a number of innovative business initiatives. In order to minimise the company’s environmental impact, Philip has worked with his Farm Manager to reduce the company’s use of fungicides by 24%, insecticides by 33%, and increase the use of organic fertilisers (including seaweed) to feed crops. In order to extract the full value from their potato crop, Philip also runs a Zero Food Waste policy. Any potatoes that don’t meet customer specification are donated to local food banks or sold for stock feed, potato waste is fed to cattle and starch is extracted from peelings so that it can be sold into the ingredients market. To improve the sustainability of manufacturing, Philp has overseen a 30% reduction in product packaging waste, and reduced plastic usage by at least 29%. Wind turbines have been erected to supply renewable energy sources and Philip is investigating rainwater harvesting to reduce the company’s mains water usage. A new Prophet IT system has also been introduced, which carefully analyses each task in various manufacturing processes, enabling Philp to target and improve tasks carried out on production lines. Philip is committed to educating fellow growers about sustainability; devising a Sustainability Awareness Sheet that is distributed to all of the company’s growers, and providing training sessions to fellow vegetables growers through the Bord Bia Sustainable Horticulture Assurance Scheme. - Innovative approach to reducing food waste, energy use and improving efficiency. - Willingness to help educate other producers about innovative, sustainable practices.